With twice the depth of the record-setting spec home, this property allows for a grand estate with the privacy that many discrete buyers are looking for. 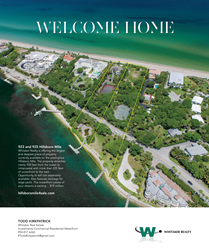 Todd Kirkpatrick of Whitaker Realty is proud to announce his new listing located at 923 & 925 Hillsboro Mile, the prestigious stretch of waterfront real estate in Hillsboro Beach, Florida. In recent news, a $139 Million spec home just three lots north of this property located on Hillsboro Mile hit the MLS and was featured as the highest priced piece of property in America in the Wall Street Journal. The listing, encompassing two lots, is offered at $19 Million and features 225 feet of oceanfront and 230 feet of Intracoastal access. The lots at 923 & 925 combined consist of approximately 4 acres and 700 feet of length, making it the deepest lot on Hillsboro Mile. A relative blank slate to a potential buyer, this property not only accommodates an extensive estate, but also a super yacht with unsurpassed access on both exposures. Hillsboro Mile, often referred to as “Millionaires’ Mile” is a thin expanse of land nestled between Boca Raton and Fort Lauderdale. The area has recently gained recognition and continues to become more and more desirable for domestic and international buyers seeking a slower pace without compromising luxury amenities, views, or accessibility. The Sales Team for the Hillsboro Mile property includes Todd Kirkpatrick, Melissa Carbonell, Steve Whitaker, and Chad Whitaker. All the details along with aerial photos of the property are available at http://www.hillsboromile4sale.com. To schedule an interview with Whitaker Realty or Todd Kirkpatrick, please contact Sara Shake of Exposed PR at 954.33.63275 or sara(at)xspdpr(dot)com. For a private showing of 923 & 925 Hillsboro Mile, please contact Todd Kirkpatrick directly. Whitaker Realty is a powerful boutique firm located on the Las Olas Isles. Specializing in Commercial, Investment and High-end homes in the Rio Vista, Las Olas, Hillsboro Mile, and Harbor Beach communities. The company prides itself on outstanding customer service and a comprehensive knowledge of the area. For more information visit http://www.w-realty.com.